魏锣沛, 李霓, 王刚, 苏凯, 李放, 昌盛, 谭锋维, 吕章艳, 冯小双, 李鑫, 陈玉恒, 陈宏达, 陈朔华, 任建松, 石菊芳, 崔宏, 吴寿岭, 代敏, 赫捷. Wei Luopei, Li Ni, Wang Gang, Su Kai, Li Fang, Chang Sheng, Tan Fengwei, Lyu Zhangyan, Feng Xiaoshuang, Li Xin, Chen Yuheng, Chen Hongda, Chen Shuohua, Ren Jiansong, Shi Jufang, Cui Hong, Wu Shouling, Dai Min, He Jie. Wei Luopei, Li Ni, Wang Gang, Su Kai, Li Fang, Chang Sheng, Tan Fengwei, Lyu Zhangyan, Feng Xiaoshuang, Li Xin, Chen Yuheng, Chen Hongda, Chen Shuohua, Ren Jiansong, Shi Jufang, Cui Hong, Wu Shouling, Dai Min, He Jie. Alcohol consumption and the risk of lung cancer in males: a prospective cohort study[J]. 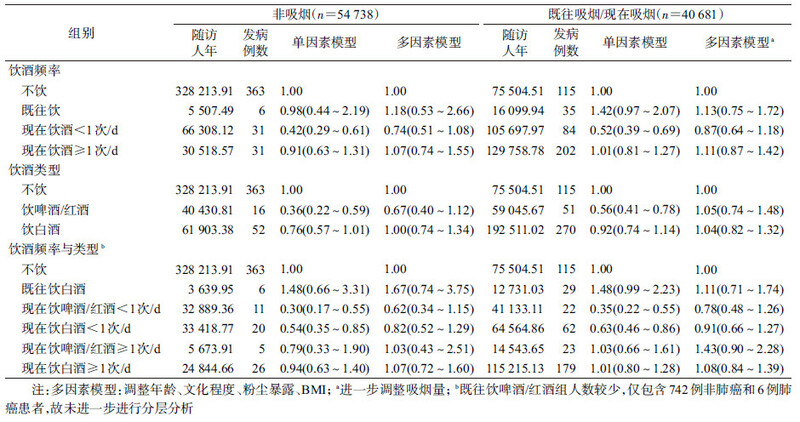 Chinese Journal of Epidemiology, 2018, 39(7): 909-913. Abstract: Objective To investigate the association between alcohol consumption and lung cancer risk in Chinese males. 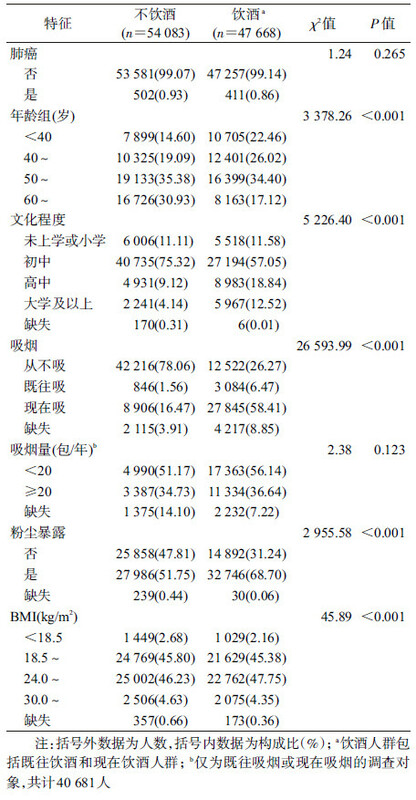 Methods Information on alcohol consumption and outcomes were collected on a biennial basis among males in Kailuan Cohort (2006-2015). In addition, electronic databases of hospitals affiliated to Kailuan Community, Insurance Systems of Kailuan Community and Tangshan were also used for supplementary information retrieval. Cox proportional hazards regression models were used to evaluate the hazard ratio (HR) and 95%CI of baseline frequency and type of alcohol consumption associated with lung cancer risk in males. Non-drinkers were used as control group. Results A total of 101 751 males were included and 913 new lung cancer cases were identified in the Kailuan male cohort study, with a total follow-up time of 808 146.56 person-years and a median follow-up time of 8.88 years by 31 December 2015. After adjusting for potential confounding factors, the HR of former drinkers, occasional drinkers (< 1/day) and drinkers (≥ 1/day) were 1.30 (95%CI:0.90-1.88), 0.80 (95%CI:0.64-1.01) and 1.04 (95%CI:0.85-1.27), respectively, compared with non-drinkers. In addition, drinking beer/red wine (HR=0.91, 95%CI:0.69-1.20) and white wine (HR=0.99, 95%CI:0.83-1.19) showed no significant association with lung cancer. The results were similar when stratified analysis were conducted. Conclusion Our study results don't support the hypothesis that alcohol consumption is significantly associated with the risk of lung cancer in males. 陈万青, 孙可欣, 郑荣寿, 等. 2014年中国分地区恶性肿瘤发病和死亡分析[J]. 中国肿瘤, 2018, 27(1): 1–14. Boyle P, Boffetta P, Lowenfels A, et al.Alcohol:Science, policy and public health[M]. Oxford: Oxford University Press, 2013.
 de Stefani E, Correa P, Fierro L, et al. The effect of alcohol on the risk of lung cancer in uruguay[J]. Cancer Epidemiol Biomarkers Prev, 1993, 2(1): 21–26. 吕全军, 姚树祥, 黄承钰, 等. 酒精摄入量与云锡(ytc)矿工肺癌的队列研究[J]. 中国公共卫生, 2000, 16(8): 707–708. 姚树祥, 张颖, 倪宗瓒, 等. 云锡矿工肺癌危险因素的队列研究[J]. 现代预防医学, 2000, 27(1): 18–19. 刘恩菊, 王学励, 袁剑敏, 等. 身体质量指数和上海市男性肺癌关系的前瞻性队列研究[J]. 肿瘤, 2003, 23(5): 360–363.